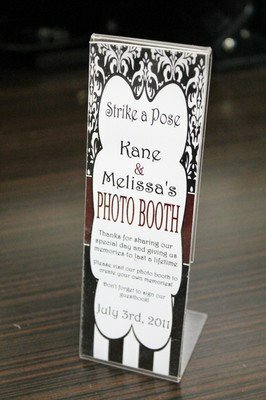 Photo Booth Frames are offered by us has several styles to choose from. Our acrylic options are a popular choice. 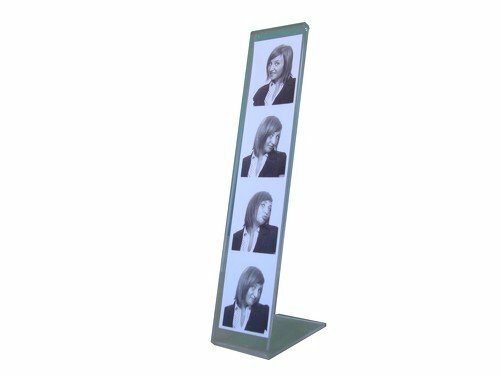 They come in L-style and T-style and are available for both our digital photo booth and classic photo booth strips. Also we offer custom sleeves for the digital photo booth strips. Choose from pre-made designs or have us create a design for you using your logo or monogram! Not only do these sleeves add a custom element to your event, but they’re affordable too! Last, but not least, our green screen photography, red carpet paparazzi photos, and open air photo booth all come with sleek cardstock photo frame folders, but we would be more than happy to provide these outside of the services rentals too. Cardstock frames are available in white, black, and gray. We also have magnetic frames! Frames offer an elegant and protective solution to prevent any damage being caused to the photographs by spilled liquids, dirt and fingerprints! Whatever your preferred style, we can provide a frame to suit your tastes and preferences! A solid frame is a reliable means of displaying your photos, without having to resort to sticking or pasting them to your walls or refrigerator door. Our custom photo sleeves are the ideal option if you’re after something more affordable- they are reasonably priced but still beautiful! You can add the option of a photo booth frame to your rental at any time. If you used our green screen photography rental, you could have a framed picture of yourself and your friends swimming with dolphins, framed and in pride of place on your mantelpiece! Alternatively, a photo of you posing with your friends ‘on the red carpet’ could adorn your walls. Why would I want photo booth frames? So frames give your guests a nice way to display their photos from the photo booth at home. 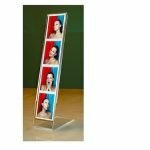 We offer T and L shaped acrylic frames. 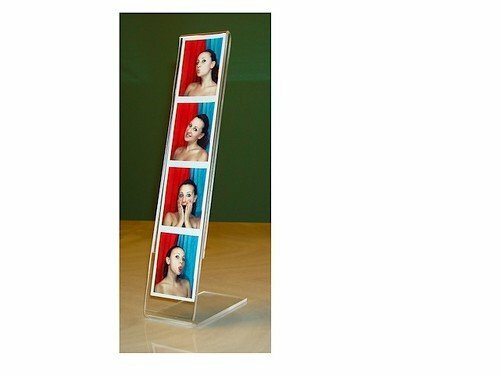 L frames are great for displaying a single photo strip from digital or classic photo booth. T frames are upright and allow you to display two photo strips back to back. If your looking for a more cost effective alternative, try our custom photo sleeves. We or your designer can customise the design of the frames. For services that produce the 2″ by 6″, 4″ x 6″ or 5″ x 7″ layout, such as our green screen photos, red carpet photos, open air photo booth or model-12 digital photo booth. Also we have a selection of cardstock frames in either size to choose from. 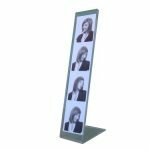 Therefore you can use the photo booth strips as favors for your corporate or weddings events. 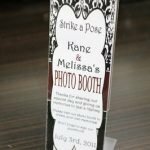 So giving your guests the frames to bring them home and display them with the picture from the photo booth or green screen photography. Our frames match the size of our photo strips perfectly and you can add to your rental at any time.